John Gray is a giant of a man, both in reputation and personal stature. 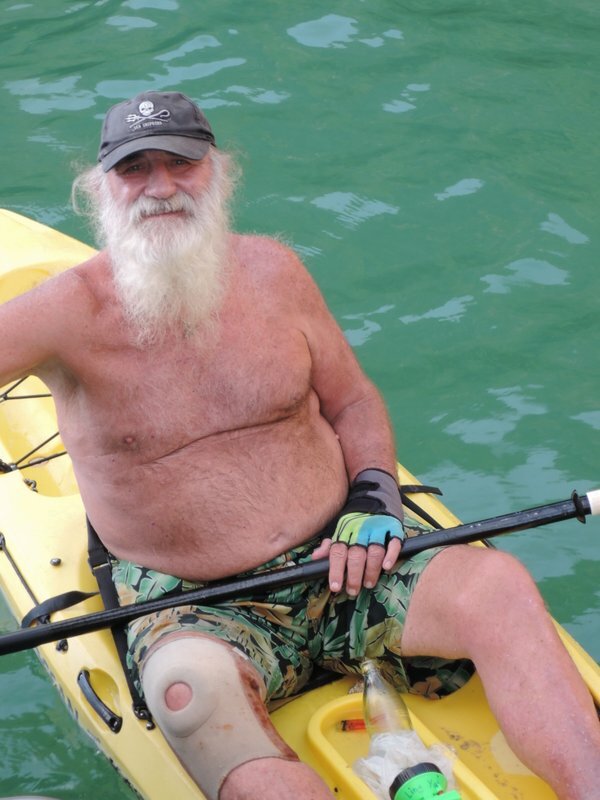 He’s affectionately known as “The Caveman” for his pioneering work in bringing the adventure sport of sea kayaking to the caves, lagoons and hongs of Phang Nga Bay. 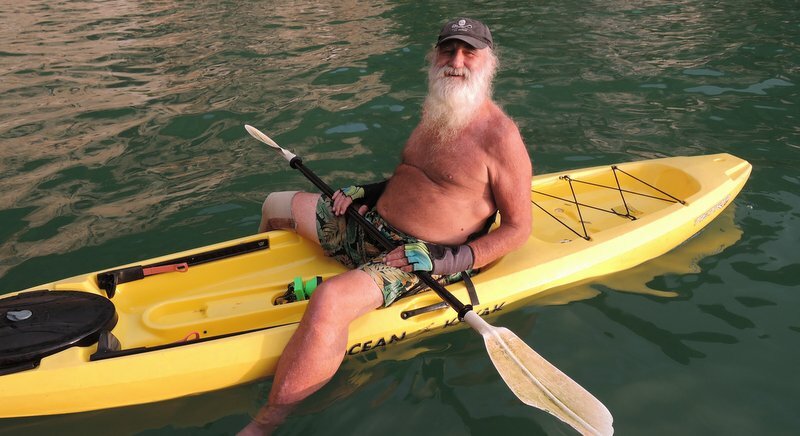 John ‘The Caveman’ Gray has been leading sea kayaking tours in Phang Nga Bay and beyond for over a quarter of a century. This article's author Baz Daniel has been freinds with John Gray for over 20 years. One of John Gray Sea Canoe's several boats. Lo Krathong day aboard one of John's boats. Alternatively, you’ll hear him teasingly called Ling Yai, literally “Big Monkey” in Thai. He’s certainly big (close to two metres tall and weighing 110 kilos) and indeed he is rather hairy and even aged 72, John still has great strength and dexterity, so the monkey moniker is pretty apposite! There have been endless documentaries and films made about his exploits and his passionate stance on environmental protection. The Discovery Channel, Animal Planet, National Geographic Magazine, all the big names have come calling upon the Andaman and the Cavemen’s door to seek out and promote this larger-than-life personality and his amazing kayaking adventures. John hails from Southern California and had an extraordinary upbringing being totally immersed in environmentalism and adventure from an early age. John’s parents met on a Sierra Club outing, and his mother was tremendously important in John’s early life. John’s mother was also a very forward looking free thinker with strong egalitarian principles. “So what religion are you now, 50-odd years later?” I asked. 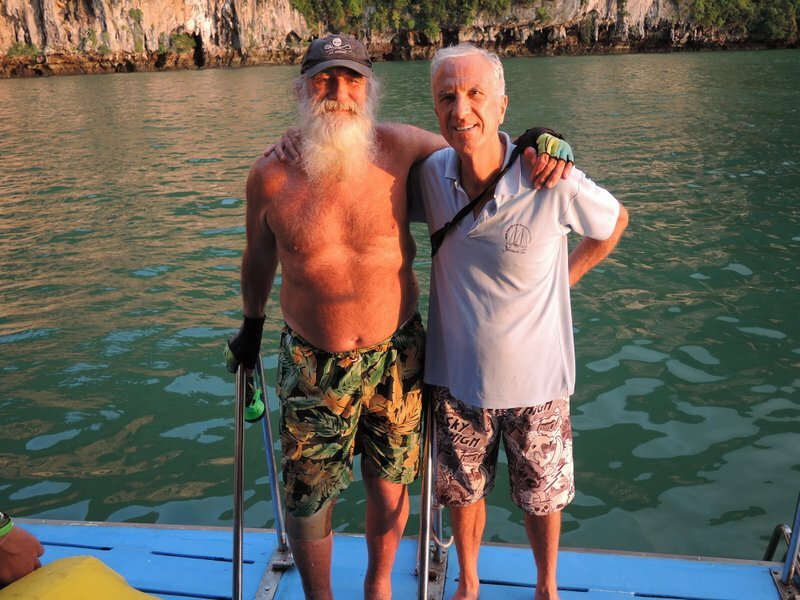 John is currently celebrating 27 incredible years of promoting sea kayaking and environmentalism in the Andaman region and I wanted to sit down and have a meal with him not only to focus on his remarkable achievements, but also to hear his views on the future of Phuket and the Andaman region. Having been friends for over 20 years, I should have known better than to expect John to join me at a dinner table and actually sit still talking for a couple of hours. “I’ll book you onto one our tours into Phang Nga Bay in a couple of days and we can do some kayaking together,” said the irascible monkey. 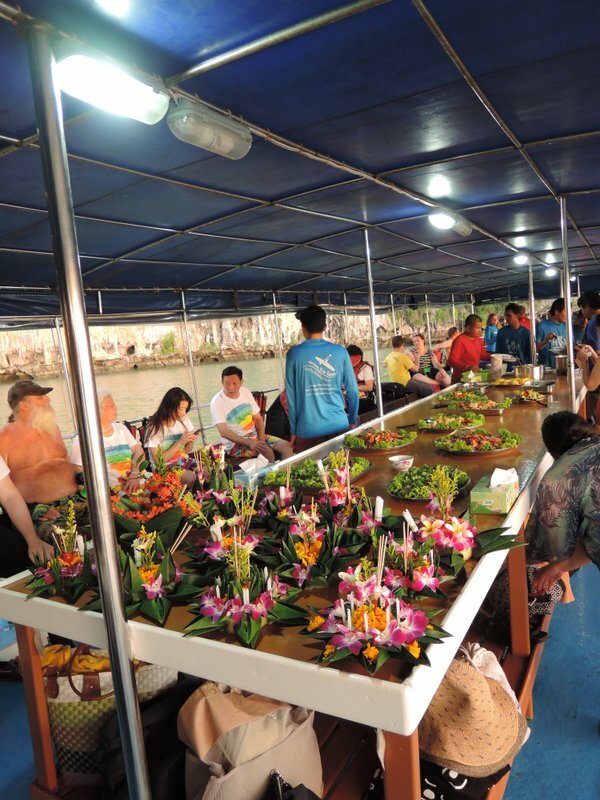 “Every tour includes lunch and dinner on the waves and the food’s better than most restaurants,” said John. And so the die was cast! 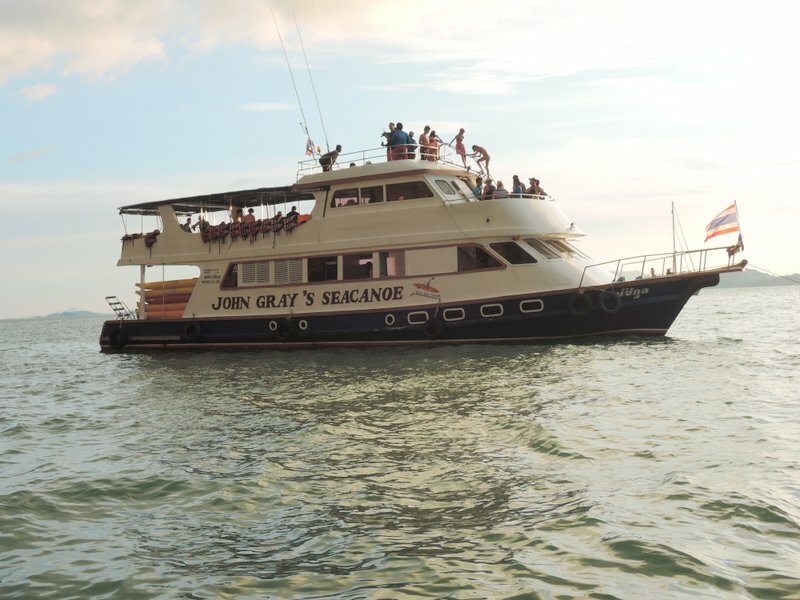 John Gray Sea Canoe is presently doing terrific business and on the particular steamy weekday that I went out they were running three full boats with over 120 paying guests on board. Both the company and John personally get rave reviews on Trip Advisor and John’s large Thai staff have all been with him for many years. Out on the waves, amidst the stunning 260-million-year-old limestone karst topography of Phang Nga Bay, you can quickly see why. 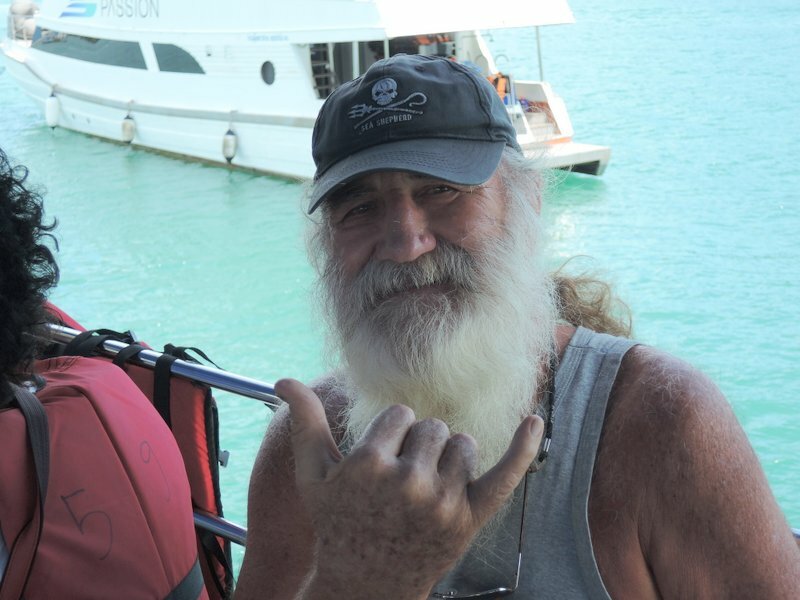 John’s hulking white-bearded presence makes him a magnet for every tourist and he greets them all with heartfelt friendliness and enthusiasm. He talks about his incredible life of worldwide adventures, kayaking, and environmentalism in a thoroughly engaging and light-hearted way and you cannot help but be charmed. His Thai staff clearly adore their eccentric boss and tease him relentlessly in an easy-going and affectionate relationship. “When and why did you come to Thailand to follow your environmental and sea kayaking passion?” I asked. 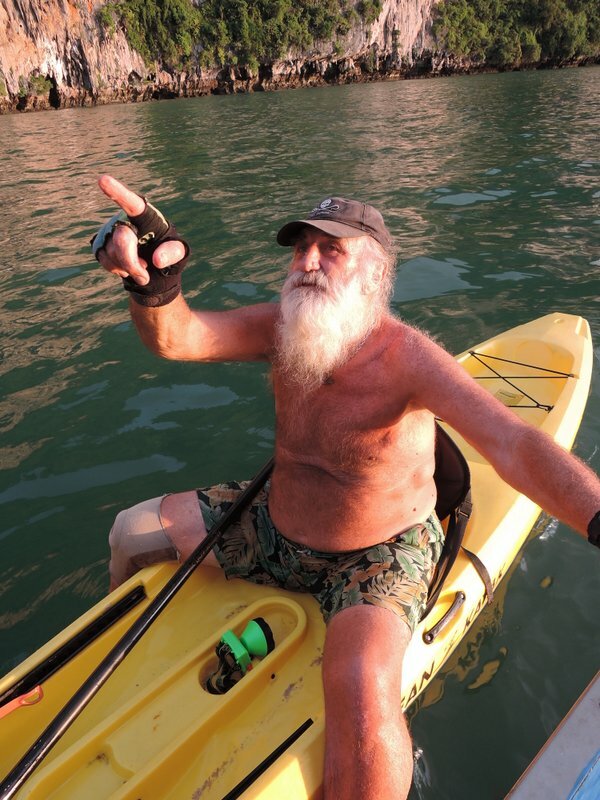 “I dipped my first paddle into the turbid waters of Phang Nga Bay in 1989,” he said. “In the mid-80s I became aware of the dangers to our planet caused by Southeast Asia’s ‘Tiger Economies’ with their huge annual growth rates coupled with a lack of environmental awareness. "When I discovered the fabulous cave systems and karst eco-sphere of Phang Nga Bay, I realised that I could piggy-back on the rising boom in tourism to promote my passions for sea kayaking while also raising environmental consciousness," he said. As we cruised back towards Phuket after a wonderful day of kayaking among the hauntingly beautiful ancient karsts and hongs I asked John his opinion of the future of this magical realm. “I would say that great strides have been made in understanding and protecting this special place. While I still collect and carry bags full of plastic waste back to shore every trip, most of the tourist operators these days do understand that keeping this environment clean is their meal ticket to prosperity. “The really big news is that after many years of lobbying, Unesco are going to make Phang Nga Bay, down to the Malaysian border, the world’s single biggest World Heritage Site. Back on dry land on my way home I reflected on the unique experience this day and this very special man had brought me. 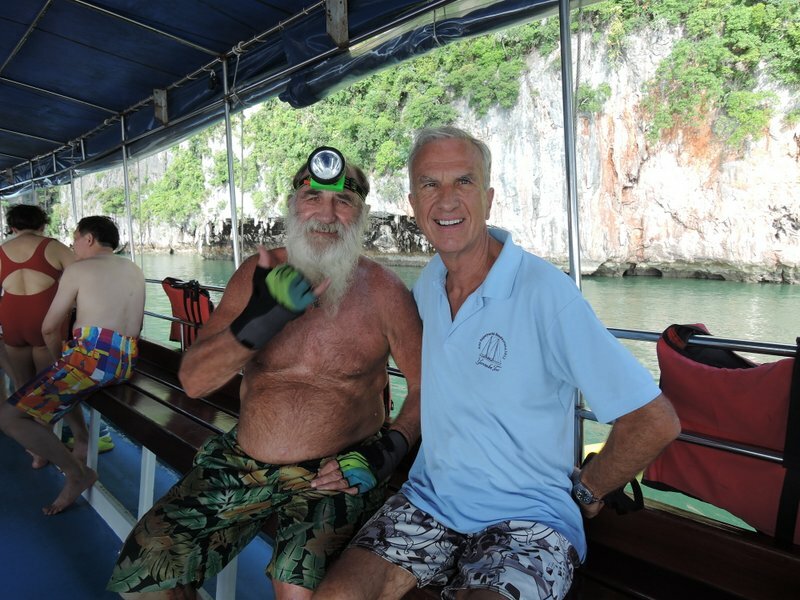 As much as his beloved Phang Nga Bay is a living treasure, so too John Gray is a living treasure of Phuket. We are very lucky to have him here.